Yesterday we bid farewell to Lesley Rudy, our Grants Coordinator for the past four and a half years. We said thank you and farewell to Lesley at a festive gathering after her last day of work attended by staff, former staff, board and grants committee members. 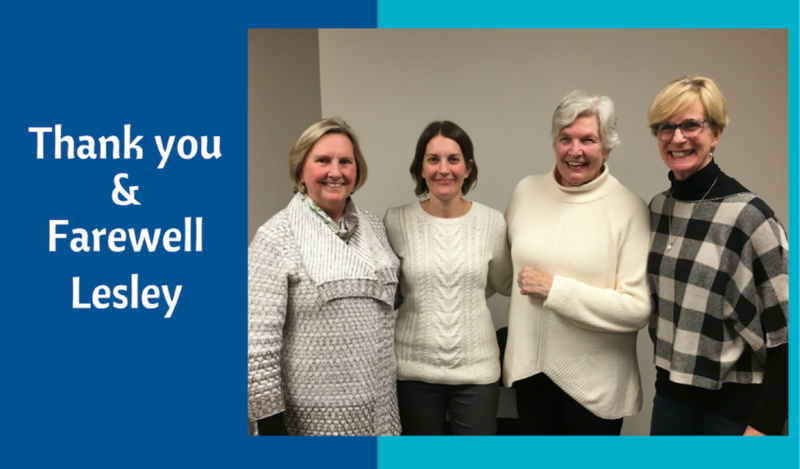 At the event we snapped this picture of Lesley with all of her Grants Committee Chairs over her time with us: Gayle Barr, Linda Lysne, and Julie Burch (current chair). What a great group of women who have been the leadership behind our granting program! Lesley is leaving the Foundation to pursue a Master of Science at Queen’s, where she will study our local turtle population in the Inner Harbour. Interestingly, her thesis idea and connection to her thesis advisor came about through her work with the Friends of Kingston Inner Harbour (a local charity which the Foundation has funded through its Community Grants Program). Lesley has been a valued member of the Community Foundation team since May 2014. Under Lesley’s guidance, our granting program has been streamlined and new granting opportunities embraced (such as the special Canada 150 grants and funding through the Welcome Fund to support Syrian refugees). And, I know from feedback I have received from many of you that grantees have appreciated Lesley’s guidance through the grant application process. In her final weeks with us, Lesley has done a great job in getting her replacement trained and up to speed, so she is leaving knowing our grants program is in good hands with Penny Scott (who we will introduce you to shortly). On behalf of the entire Community Foundation team, I want to say thank you to Lesley for her years of dedicated service and many contributions to the Foundation. We wish you all the best as you pursue this new chapter in your life.